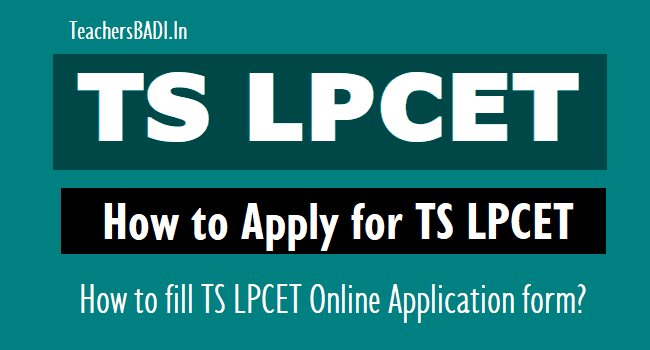 How to Apply for TS LPCET 2019, How to fill TS LPCET Online Application form?, TS LPCET Online applying Procedure, TS LPCET Online application fee, Last date to apply for TSLPCET. Online applications are invited from the candidates who intend to take admission into language Pandit Training Course (LPT) in Government IASE / CTEs and Private Language Pandit Training Colleges in the State of Telangana through LPCET 2019 on the dates to be notified shortly through Computer Based Test (CBT) online mode. Applications will be received only through ‘ONLINE’ on LPCET 2019 website http://lpcet.cdse.telangana.gov.in from ...04.2019 to ...04.2019. The fee towards submission of application online and for the conduct of examination is Rs.400/-. Candidates shall pay the fee through LPCET website between ...04.2019 and ..04.2019 and submit online application at the LPCET website http://lpcet.cdse.telangana.gov.in between ...04.2019 and ...04.2019.
i. The candidates shall first download the ‘Information Bulletin’ free of cost from the LPCET website http://lpcet.cdse.telangana.gov.in, go through it carefully and satisfy their eligibility for appearing at LPCET, 2019.
ii. The candidate after satisfying herself/himself about the eligibility criteria for LPCET shall pay a fee of Rs.400.00 through LPCET website between ...04.2019 to ...04.2019 for submission of application Online. At the LPCET website, the candidate has to give the required preliminary data (i.e. Name of the candidate, Date of birth, Gender, whether the candidate belongs to Telangana State and mobile phone number). On receipt of fee at LPCET website the candidate shall be issued a ‘PAYMENT REFERENCE ID’ with which she/he can proceed with submission of application online. Issue of ‘PAYMENT REFERENCE ID’ does not mean that the candidate has completed submission of application online. It is only a confirmation of the fee received. a) Applications with no photo / unclear photo / inadequate size photograph will be rejected. Hall – Ticket will not be issued to such candidates. Hence, after pressing the ‘UPLOAD’ button check if the photo is of required size, clear and is of the same candidate of whom the details are to be filled in the application. If the photo is smaller in size, not clear or does not belong to the candidate press ‘UPLOAD’ button below the photograph on the application form and ‘UPLOAD’ again. i. The candidates shall first download the ‘Information Bulletin’ free of cost from the LPCET website http://lpcet.cdse.telangana.gov.in, go through it carefully and satisfy their eligibility for appearing for LPCET, 2019.
ii. The candidate after satisfying herself/himself about the eligibility criteria for LPCET shall pay a fee of Rs.400.00 through TSONLINE between ...04.2019 midnight for submission of application Online. At the LPCET website Centres, the candidate has to give the required preliminary data (i.e. Name of the candidate, Date of birth, Gender and mobile phone number). On receipt of fee at LPCET website the candidate shall be issued a ‘Payment Reference ID’ with which she/he can proceed with submission of application online. Issue of Payment Reference ID does not mean that the candidate has completed submission of application online. It is only a confirmation of the fee received. iv. Paste the photograph on a white paper and sign below (sign in Black Ink only). Look for the sample above. Ensure that the signature is within the box. Scan the required size containing the photograph and signature. Please do not scan the complete page. The entire image consisting of photo along with signature is required to be scanned and stored in *.jpeg format on local machine. Ensure that the size of the scanned image is not more than 50kb. If the size of the image is more than 50 kb, then adjust the settings of the scanner such as dpi resolutions, number of colours during the process of scanning. a) Applications with no photo/ unclear photo/ inadequate size photograph will be rejected. Hall -Ticket will not be issued to such candidates. Hence, after pressing the 'UPLOAD' button check if the photo is of required size, clear and is of the same candidate of whom the details are to be filled in the application. If the photo is smaller in size, not clear or does not belong to the candidate press 'BACK' button below the photograph on the application form and restart with scanning of the photograph. b) Complaints relating to mismatch of photograph and candidate details will not be accepted after submission of application at any cost. No request for change of photos / information regarding candidates details shall be entertained. Go to http://lpcet.cdse.telangana.gov.in by using user guide. (a) On submission of application form online the candidate shall be given registration number which should be kept carefully for any kind of future correspondence. Submission of application can be considered to have been completed only on receiving reference ID number. (b) On submission of application form online the candidate shall be given registration number which should be kept carefully for any kind of future correspondence. Submission of application can be considered to have been completed only on receiving registration number. (c) On completion of submission, the candidates shall take a printout of the application and store it for future use. Candidates should not post the printout of the application to LPCET office. working days from ...04.2019 to till the date of examination. (e) In any case applications will not be received in any kind of manual form. (f) Candidates can download their Hall Tickets from the dates to be notified on the website at http://lpcet.cdse.telangana.gov.in. Candidates may keep viewing the website for information on dates of download of Hall Tickets. In case any candidate cannot download the Hall ticket during the dates notified for download of Hall Tickets, she/he should contact the help line by giving the details of the Payment Reference ID of the fee paid and the Registration number of the application submitted. (g) Request for issue of duplicate Hall Ticket will not be entertained after the examination in any case. (h) Fee once remitted shall not be refunded under any circumstances. (i) It is to be noted that if a candidate has been allowed to appear in the LPCET it does not imply that the candidates' eligibility has been verified. However qualifying the LPCET shall not confer a right on any person for admission, unless be possesses qualifications mentioned in G.O.Ms.No.10 SCHOOL EDUCATION (TRG) DEPARTMENT Date : 06.04.2018 . The eligibility shall be, finally, verified by the Convenor at the time of counselling for admissions if provisionally selected. (j) Furnishing of false, wrong or inaccurate information/ qualifications leads to cancellation of the test result and even prosecution in appropriate cases. (k) No request for re-checking, re-assessment, re-evaluation or scrutiny of Computer based test (CBT) will be entertained.